Despite its ongoing attacks on Israel, Hamas found time Tuesday to execute six Gaza residents without trial. The terrorist group claimed the six were “caught red-handed” assisting Israel. The six “possessed hi-tech equipment and filming equipment to take footage of positions,” Hamas commanders said in a radio broadcast. 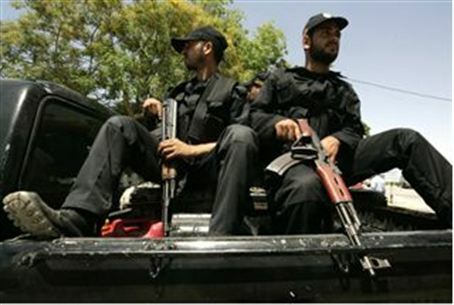 Gaza witnesses said the men were pushed from a vehicle and shot. Pictures from Gaza showed the body of one of the men being dragged behind a motorcycle. This is the second time since Operation Pillar of Defense began last week that Hamas has executed Gaza residents for allegedly helping Israel in its counter-terror efforts. Last week Palestinian Authority media reported that the body of a Gaza man had been found in the street under a picture of a Hamas terrorist holding a rocket. Around the man’s neck was a sign accusing him of giving Israel information that helped it target and kill 15 Hamas commanders.